Rajiv van la parra has Monday a fine received from Feyenoord for his outcry Saturday from his turnout in the duel with Heracles Almelo (2-1 victory). Nicolai Jørgensen, who red was also fined. He will also receive a suspension of two matches of the KNVB. 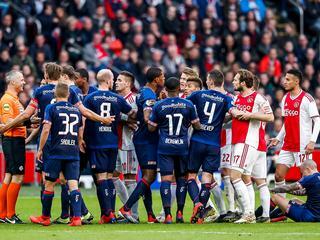 Giovanni van Bronckhorst announced after the race in The Cockpit already that van la parra punished for his behavior. Midfielder van la parra, who aanvoerdersband wore, was a quarter of an hour for the time of the field removed in favor of striker Robin van Persie. The position at the time was 1-1, so Van Bronckhorst aanvallender wanted to play. Steven Berghuis made five minutes later the winning hit. Jørgensen was against Heracles in the 65th minute and sent off the field due to natrappen. The striker has the settlement proposal of the prosecutor professional football of three games suspension one of which is conditionally accepted. The Dane misses next Saturday’s important thuisduel with AZ. The two teams compete for third place. Feyenoord are third with four points lead on the team from Alkmaar. Jørgensen missing next Wednesday in the away game against hekkensluiter NAC Breda. The attacker may once again play against Fortuna Sittard, 28 april) and ADO Den Haag (home, may 12).